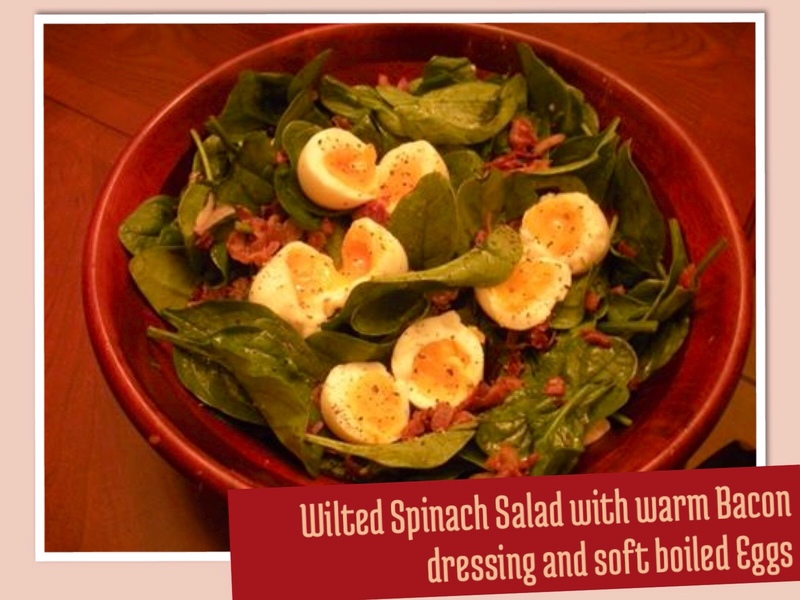 Wilted Spinach Salad with Warm Bacon dressing and Soft boiled Eggs! Wilted Spinach Salad with Warm Bacon dressing and Soft boiled Eggs…..a lovely winter salad where three simple ingredients come together to spell big bold flavor! Wash and dry spinach and place into a large mixing bowl. Soft boil eggs (cook eggs for a minute lesser than for a full-boiled egg) and cut in half. While the eggs are cooking, fry the bacon and remove to a paper towel to drain, reserving 3 tbsp of the rendered fat. Crumble the bacon and set aside. Transfer the fat to a small saucepan set over low heat and whisk in 3 tbsp red wine vinegar, pinch of sugar and a dash of dijon mustard, and some salt and pepper to taste. Add the dressing and bacon to the spinach and toss to combine. Serve immediately. Note: you can add sliced red onions and mushroom to this salad if you like!